07.10.2011: Godzilla Crushes The Kaijucast HQ with Matt Frank! This month, the Kaijucast is joined by the one and only Matt Frank (yay)! Howdy, Godzilla fans! Episode number thirty seven is upon us and this month, the magic of the interwebs brings us an interview with the one, the only, long-time kaiju fan and artist Matt Frank. If the name sounds unfamiliar to you, Matt was the creator of the NeoGodzilla monster redesigns that have caught the eyes of many Godzilla lovers for years. If you aren’t familiar with those, perhaps you are familiar with a little comic called Godzilla: Kingdom Of Monsters? You should be; I talk about it enough! Well Matt has been making the retailer incentive covers and some of the other exclusive covers, too, and I thought having him on the show would be a great excuse to shoot the radioactive breeze with another fellow G-Fan! 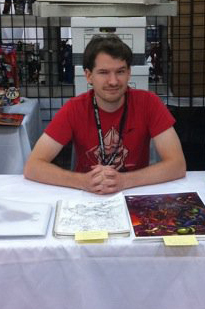 While it would be very easy to fall into the standard tell-me-about-working-on-IDW’s-Godzilla-series line of questioning (which we do cover a little bit), Matt is such a devoted Godzilla fan that I really just wanted to talk about his fanaticism for the Big G and any projects he has going on. What we came up with was really conversational and it was so much fun talking with him that when we hit the forty-minute mark, I really could have just kept going. Because of that, I’m hoping we can get Matt back on the podcast in a couple of months for a listener Q&A. In addition to enjoying Matt’s dulcet tones, make sure you check out the show notes below for a lot of linky goodness – both to a couple of Godzilla-related news items and some awesome local flavor. And what would an episode of he Kaijucast be without a tasty helping of monstrous music. Don’t forget that your homework this month is to submit your thoughts, questions and reviews for Toho’s 1999 response to the Tri-star film, Godzilla 2000. I’m pretty sure we are watching the English dubbed version since that is the most widely distributed version here in the U.S. – but if you watch a subtitled version, that’s fine as well. We’re also probably going to join forces with the DriveInMob folks for the livetweeting, so if you are on Twitter, keep an eye out for that announcement both on twitter and Facebook. If you watch the film beforehand and want to submit your thoughts, questions and reviews of the film, just make sure you email me by July 25th to have your homework included on the podcast. I hope you enjoy the episode and I hope you join us again at the end of the month!